With the right Electronic Data Capture tools in place Sponsors realize cost savings, time savings and have transparency to all aspects of study data in an instant. With paper trials, the delay in access to data can range from weeks to months and cost millions in lost sales. Traditional paper-based clinical trials using Case Report Forms are expensive, time consuming, introduce many layers of human error and delay the trial outcome and, ultimately, the start of revenue generation. 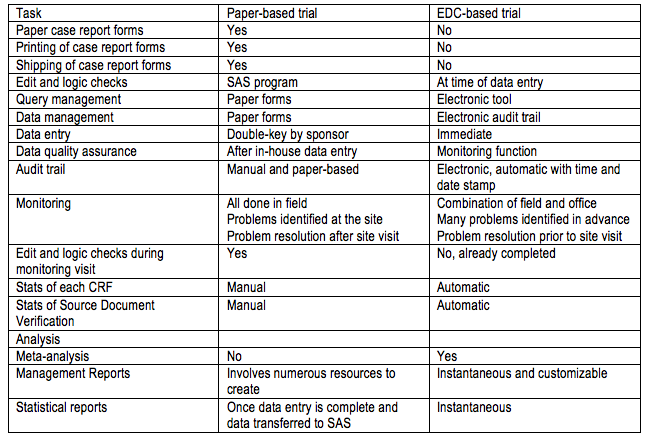 When looking at costs, EDC-run trials can be as cost effective, or more so, than paper trials. Many factors in how the latest in EDC technology is implemented and run have equalized the costs as compared to paper over the duration of a study (or multiple studies), both direct and downstream. Consider the direct costs of printing and mailing CRFs, double data entry, monitoring visits, resolving queries using paper, data cleaning costs, and the costs of storing and archiving thousands of pages of paper. All of these costs are also factors in the delay of the study database lock compared to a study run using EDC where there are significantly fewer queries and monitoring visits, faster resolution to queries, immediate access to reports and study data and an overall shorter study duration. Managing data queries involves widespread human involvement during a paper-based trial. The costs associated with the management and tracking of this paperwork are extremely high. Weeks or even months of time can be saved by eliminating manual management of this process in favour of electronic data capture. Looking at the paper-based process, data must be entered into the database. The data management team is required to interpret handwriting, perform double data entry, and involve themselves with extensive trafficking of data. To analyze that data it must first be transferred to a program such as SAS, where the appropriately qualified people can review it. It must then be reviewed and follow up with data queries. These queries are sent to the site for resolution and their responses must be re-entered and rechecked. In paper-based studies, the extraction of data for study management reports is time consuming and requires the efforts of numerous resources in order to compile the reports necessary to ensure the success of the trial. Only once the data has been cleaned and its integrity validated can the final analysis take place. This results in the late visibility of the data. Another shortcoming of the traditional paper-based data collection process is its failure to collect data about the data. This metadata is an extremely useful tool, allowing sponsors to analyze key study metrics. 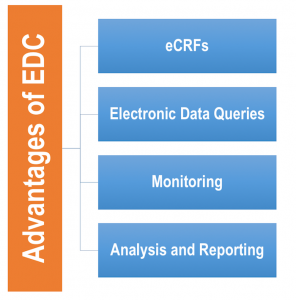 With EDC, an array of standard and customizable reports are available on demand. Study information is accessible at all times from within the web-based system and on any device (computers, iPads, iPhones). Daily, weekly or monthly reports can be automatically emailed out to the study management team and Sponsor. There is no longer the requirement of transcribing medical records onto paper CRFs. Without paper CRFs there is no need to store numerous binders in limited space as data is archived electronically with no need for off-site storage and archiving. Direct data entry also vastly reduces the number of errors in the data. Since the query process is dynamic and automated, the Investigator and site staff can respond to questions in real-time with patient charts still beside them. 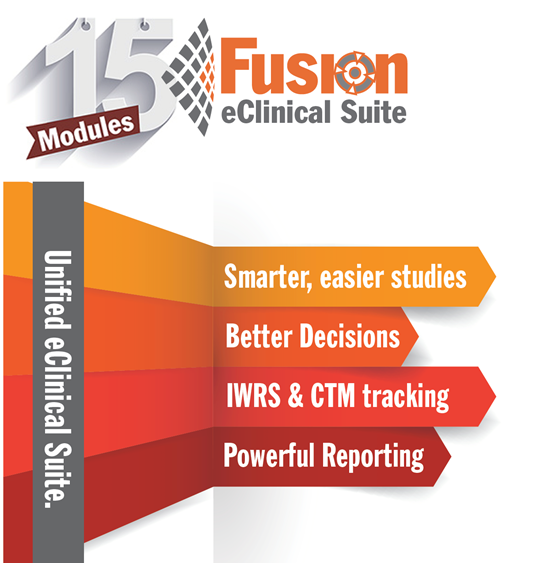 No more hassle of having to request charts from medical records on numerous occasions. Digital signature of documents is also possible using EDC. Implementing an EDC solution gives site monitoring staff the ability to review eCRFs prior to site visits which leads to proactive site intervention and resource allocation. Virtual monitoring reduces travel, tracking and mailing activities which has a direct impact on the overall cost of running the trial. With EDC, monitoring becomes a combination of both office and fieldwork. CRFs can be reviewed for logic and edit checks prior to an actual site visit. Problems can be identified in advance and the resolution can be implemented before the next site visit. Monitors have access to patient status, including the availability of CRF visits ready for source document verification well in advance of their next monitoring trip. Management style reports offer the answers to many of the questions that an excellent and efficient monitor needs to be able to answer at the drop of a dime. Examples of these include: How are my sites doing? What is the enrollment like at my site? How many open queries are there? What needs to be improved? Electronic trial management systems capture this type of data, making for up to the minute, powerful study tracking and metadata. There are a number of tasks eliminated from the data management team once EDC is implemented. Prior to the first patient being entered, there is no need for database programming, or edit check programming. Once the first patient has started in the study, there is no need for double data entry and the associated tracking of CRFs and queries. Paper management becomes obsolete as does in-house data quality assurance.